Didn’t remember being on Blog Talk Radio’s e-list that fall morning last year. It included suggested shows tailor made for me to listen to. Never really been an avid talk-radio listener, so I had probably caught a broadcast of some sort and signed up. The words “Suicide Awareness” jumped out at me and I scrolled down and saw an ad for GrindHard Radio, A picture popped up and I clicked the link. I knew it was an urban show but wasn’t quite prepared for the amount of profanity so I paused and prayed. As a Suicide Prevention advocate, it was very important to hear every single word on the broadcast. I knew they had something very special about them in the way they conveyed Suicide Awareness. It wasn’t the watered down after school special version of life but rather the “It’s a Hard Knock Life” version. They spoke perfect English laced with a gritty dialect, reaching a demographic of my beautiful African American people that had been deemed unreachable. I said, “Amen”, exhaled, pressed play and held on for the ride. About an hour and 20 mins later I heard her voice…and I felt God. As tears covered my cheeks I began to pace the floor. I thought about all the suicidal and hurting people all over the world who refuse to get help or call crisis lines because they feel misunderstood. They feel as though the person on the other line cannot relate to their experience so how could they possibly help. In urban communities, those in crisis may wonder who’s on the other end of the line and if they really want to talk about poverty, homosexuality, dodging bullets, prison, single parent homes or gang life. Many African American boys grow up being told that only punks cry and girls are raised to stay strong. Sometimes that results in looking strong instead of actually being strong. Not to mention the stigma attached to those struggling with mental health issues in communities of color and faith. 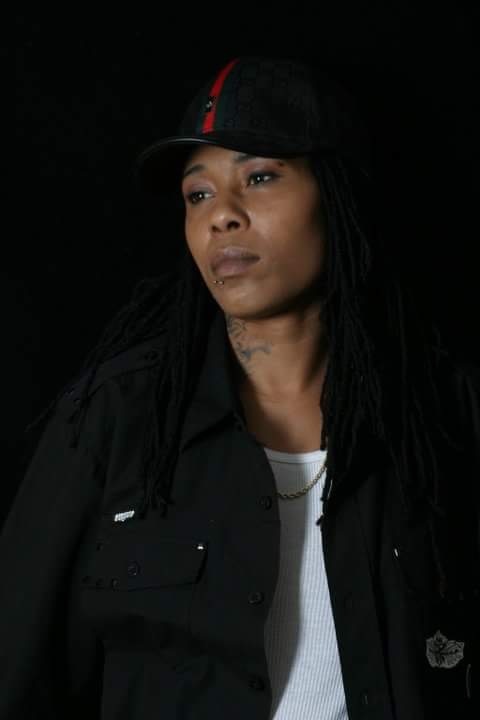 Meet the 1st Lady of GrindHard Radio V Slim…the she behind the ‘her voice’ I heard the night I felt God…. First I would like to thank you for the opportunity to share a piece of my story that will hopefully encourage or maybe even inspire someone else who may be able to relate to my journey. The blessing and pleasure is ALL mine!! Now, a little about me. My name is China (pronounced Chee-na) Sykes a.k.a Virginia Supernova Slim and I am a 32 year old African-American female recording artist/writer who was born in Portsmouth, Va., raised in Lynchburg, Va., and groomed in various parts of Georgia. since Sept. 11, 2001 when I left home at 18 to pursue a music career. I have experienced a lot (good as well as bad) in my life, but I know that ALL things work together for the good of those that love God and are called according to His purpose so I try to remain optimistic and have faith that God is in control. 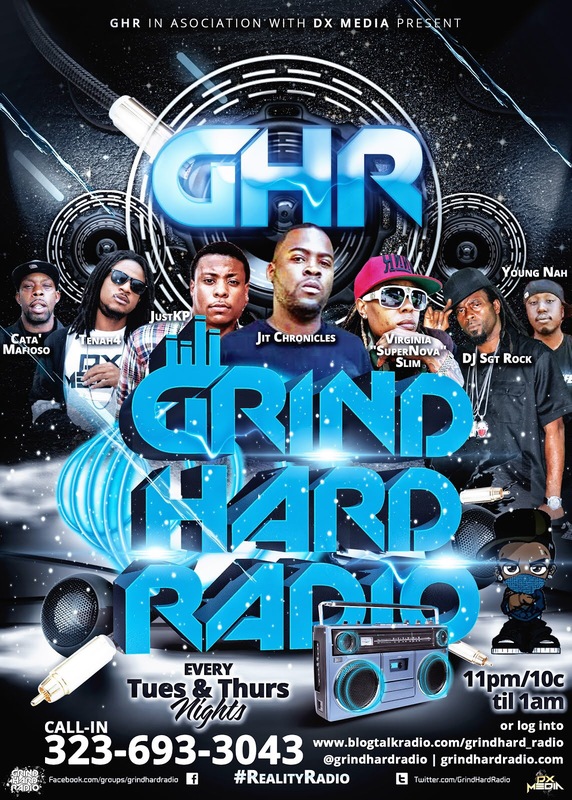 I first learned of GrindHard Radio thru the Suicide Awareness show last year. Was that the first of its kind? How did it come about? GrindHard Radio caters to independent music artists and people who grind hard, but we have awareness shows every chance we get to put a spotlight on topics and issues that are of MAJOR importance to us and our respective communities. Suicide Awareness was a topic that we had never covered before, but I suggested because it was a matter that was very near and dear to my heart considering the fact that it was so personal. I suffer from mental health illnesses such as post traumatic stress disorder, manic depression, obsessive compulsive disorder, and insomnia, and had been experiencing some difficulties in my life, relationship and family that weighed me down enough to contemplate suicide. Had you planned to share your story during that show? Honestly, from time to time I pray to God to lead me and give me the words to say in certain situations in general, but I never “rehearse” for a show. I like to freestyle and let the spirit of the conversation at hand lead me. I had NO idea what I was going to say but I knew that I had to be honest and say SOMETHING REAL! I am often accused of being too forthcoming when it comes to my personal business and experiences, but my motto is, TO GOD BE THE GLORY!!! How can I help someone who may be going through something similar to what I’ve been through or am going through if I’m too ashamed or embarrassed to share it?! I feel like I can only be considered to be “real” if I share the good and the bad, my ups and my downs. For a long time people only saw the material things and status that I obtained, but didn’t respect or understand my progress because they didn’t see the blood, sweat, tears, abuse, neglect, disappointment, danger, etc. that I had to endure to get or achieve those things. So in essence, people envied what I considered to be a lie because half of the truth is not the truth. I wanted people to understand that if they knew what I or anybody else was going through it would probably change their perspective of how easy our lives seemed. Things ALWAYS look different from the outside looking in! It’s like a car with a new paint job that has no engine, brakes, etc. So, when I started to share my testimony, as with any other show, I came from my heart with a sincere objective of encouraging anyone who was listening and showing them that if God could save ME and allow me to see my life as half full instead of half empty, He could save ANYBODY! Suicide and suicidal ideation brings with it great stigma. What has been your experience with Suicidal ideation and/or attempts? The closest I’ve come to actually committing suicide was fondling a bottle of pills and standing on the shoulder of highway Interstate 20 in Atlanta about to run out in traffic, but the thoughts have crossed my mind before that incident and honestly even since then. Sometimes I get discouraged and feel like a waste of a life, a burden on the people I love, a failure, etc but thankfully I have a God who sits high and looks low and He ALWAYS sends someone to comfort me and encourage me when I’m crying out for help. For a long time I WAS ashamed of what I was going through, but I realized that a closed mouth doesn’t get fed and the fact that I was begging for help, even if it was nonverbal, indicated to me that I DIDN’T want to die I was just tired of feeling like I was not LIVING! Also, i realized that i cant possibly save someone else if I am too afraid of being judged to share. When you allow a thought to fester in your mind you are essentially giving that idea, which was probably planted by the devil, room to grow. I’ve since learned that I diligently try to chop those thoughts down at the root to ensure that they don’t get out of control. Just to give everyone a little information about me and a little background for where I believe things in my life went awry, I grew up the middle child of three girls all about a year apart and we were raised in the church as daughters of a minister and nieces of the pastor. When our dad started doing drugs, it tore our entire family apart and pitted us girls against each other. We also began to act out and redirect our disappointments and frustrations for our father to our innocent mother. Our dad was not a villain, the drugs he was addicted to was the culprit and prohibited him from not only caring about himself but also caring for us. Either way, that was a turning point for me because I was so family oriented that the division of my immediate family made me long for a family of my own as well as a successful career to provide for them. So at 18, I packed up my things and my mom drove me to Ga and dropped me off. I had visions of grandeur, but reality soon set in and I realized that I was a small fish in a big pond and was ill equipped for my journey on my own. Over the almost 14 years that I lived in Ga. I was homeless several times, I went to Job Corps. in Albany, Ga., I went to jail several times, I was in several lesbian relationships (notably one where a child was involved that I still provide for) that almost always took a toll on me and then after draining me ended ridiculously bad. I made efforts to build numerous relationships only to have the people turn on me and stab me in the back in the worst ways. I was robbed at gun point, I had to do unspeakable acts to survive, and then I ended up in prison and came home to nothing! On top of the health issues, mental health issues (manic depression, O.C.D, insomnia, anxiety, and P.T.S.D), and desire to be a mother that I was dealing with, I met someone in prison who I waited for and when she came home over a year after I had been home all she did was make my life harder and reduce my will to live even more. My mental stability began to diminish and I felt like a failure and a waste of human life because if she didn’t love me and respect me, I felt nobody else would. I was hurting inside and it seemed like no one cared. I thought the world would be a better place without me and it wasn’t like anybody was going to miss me anyway. I was fighting with my family, I was fighting with my health, I was fighting with my relationships, I was fighting with my spiritual relationship with God, I was fighting to get my music heard, but most importantly I was fighting my calling and didn’t realize the connection that all of those things had! God was trying to get my attention while I was trying to end my life because I felt like I had no purpose. I was standing on Highway Interstate 20 in Atlanta one night and I was just fed up with everything. I did not have an ounce of strength left in me to fight. My boss, the C.E.O of Grindhard Radio, and my best friend and brother Cody Nixon a.k.a Jit Chronicles called me and basically just encouraged me not to give up and he told me to think about my music, and all of the people who love me, and who would be affected by me making such a rash decision. At that moment I realized that my story wasn’t supposed to end like that. Yeah, I had been through a lot, but I’ve never seen a mountain that My God can’t move out of the way! It is not by my might! God has an expected end for us all if we just hold on and faint not! I have learned to empower my mind with endurance mechanisms because the race is not given to the swift nor to the strong, but to the one who endures until the end. Everything you allow yourself to feel starts in your mind. If you want to change the way you feel, change the way you think. We have the power to create whatever we want, but we can’t do that focusing on what we don’t want. My entire life, I constantly had encounters with police because that’s what I feared and focused on so that’s what I created. Going to prison and the damage from the negative relationship established there was the toughest experience I’ve endured thus far along with my dad’s drug addiction that has spanned my lifetime. But where I feel like the impact from my dad damaged me…I feel like the impact from prison broke me. It hurt me on the deepest levels to disappoint my mother, the rest of my family, my supporters, my music, and my daughter and also it broke me mentally to be in that institution seeing, experiencing, and ultimately surviving everything that I encountered. Being subjected to such demeaning treatment and utter lack of respect from other human beings was earth-shattering and life-changing. I cannot IMAGINE what slavery is like! I am saddened to this day by some of the things that I have seen and had done to me while being incarcerated. I am the kind of person who tries to retain information from experiences to improve myself and the way I do things, but I wouldn’t wish that method of gathering knowledge on my worst enemy. People are professional con-artists and experienced in manipulating and controlling people by means of creating representatives to deceive them in order for to obtain something they want or need from them. I trusted the WRONG person. God delivered me from that and I should have left all of that behind me instead of trying to create a family and a future with someone I didn’t even know who came home and started a family with a guy she worked with. Feeling destroyed by everything and wanting to die was where God was FINALLY able to reach me! I was so helpless that I was unable to move and being unable to speak is where you will hear. Everything that I experienced taught me something that will be vital to my position when God finishes grooming me for where He is taking me. Nothing that I have been through was a mistake because God is using it ALL for HIS GLORY!!!! My Mom Pastor Dr. Lisa Sykes Chilton say’s, “I must be completely transparent”, and that’s exactly how I feel! I have to share the struggles and failures so that people will understand the volume of the deliverance and be able to rejoice knowing that the same God who did it for me can and will do it for them! That’s what’s it’s all about, encouraging one another and winning souls for the Kingdom of Christ! Our life is not our own, it was bought for a price that can never be repaid, so instead of worrying about ourselves we need to seek first the Kingdom of God, be about our Father’s business, and let Him worry about ours. I went from being a convicted felon, a failure, a disappointment, and a waste of talent, to being a two time honor graduate, a certified welder, a certified HVAC Technician, a recording artist, a writer, a motivational speaker, and more all because I allowed God to be the potter who put me back together again. It’s not about how you fall, but how you dust yourself off and keep your feet moving. I wanted to provide the link for the Suicide Prevention Awareness Show that we did on GrindHard Radio where I shared my story with the world for the very first time and I pray that someone is blessed by me refusing to be ashamed of what God allowed me to experience, so please check it out and share it! ++Join me for Part 2 of V Slim’s interview as we conclude her story next week! We’ll delve more into the music side of her career and continue to hear her heart about issues that matter to her and the legacy she desires to leave. September is #SuicidePreventionMonth! You can help by please sharing her story with others who may feel hopeless and ready to give up. As usual thanks for your love and support of authenticitee: inspiration without the other stuff. VSlim and to you my sister Eri.